Alexander Sutherland F C elder of Roster died 20th July 1872 aged 64. In the Lord have I righteousness and strength. Son John died 5th December 1847 aged 5. Daughter Catherine died 5th December 1847 aged 3. Daughter Margaret Sutherland died 14th October 1854 aged 14. 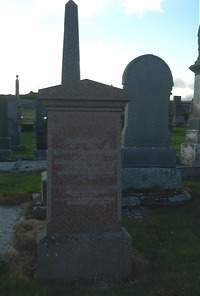 Wife Elizabeth Mackay died in Thurso 14th May 1897 aged 89.